As a devoted thrift store shopper, auction-goer, and yard sale junkie, I always joke that my hobby is also my part-time job. Since roughly 95% of everything I buy is intended for resale, I'm constantly looking for items I can flip without a huge time investment. 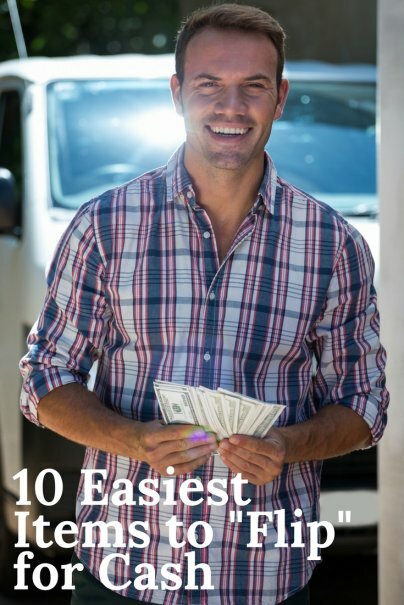 If you know what to look for, there's money to be made around every corner — maybe even in the stacks of stuff collecting dust in your basement or garage. 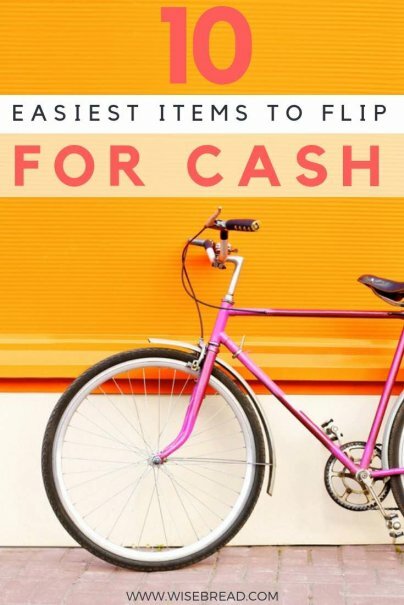 Here are 10 of the easiest items you can flip for fast cash. One of the five best deals in every thrift store, quality furniture is an easy flip. Usually, a light sanding and application of a one-step stain/sealer is all you need to bring a worn piece back to life. Stick to small, versatile pieces that will appeal to apartment-dwellers and look for forms that can be creatively upcycled (an old roll-top desk becomes a bar or an antique steamer trunk gets a second life as a coffee table). Reduce prep time by avoiding items with heavy ornamentation. Also, when buying dining room or office chairs, steer clear of oddly-shaped seats — they're twice as hard to reupholster. With the retail price of clothing hovering near the stratosphere, gently-used, seasonally-appropriate brand-name clothing is an easy sell. Look for well-made items with no missing buttons, damaged zippers, extreme alterations, stains, or weird smells. Just last week, I bought a pair of nearly-new Sperry Top Sider leather shoes for $3.99 and flipped them online for $32. (See also: 9 Qualities to Look for in Well-Made Clothing). Its own unique category, vintage clothing can include a quirky shirt made 10 years ago or a classic hat made 80 years ago. Get a feel for what's in-demand by researching completed sales on eBay. Remember, as with all other clothing, condition is everything. Several weeks ago, I paid $2.99 for a '90s-era Levi's denim cap in mint condition. Three hours after I listed it online, it sold for a cool $105. Cocktail shakers, tumblers, swizzle sticks, ice buckets, and related items appeal to the hip and well-heeled everywhere. Matching sets are the most coveted, but mismatched or harlequin sets sell well, too. Just make sure each piece is from the same general era. Recently, a 1960s set of six lowball glasses with matching decanter sold on eBay for $69.99. When people are moving or otherwise motivated to declutter, buyers can often score power tools at bargain-basement prices. Test each item before you buy, give it a light cleaning, grease what needs greasing, and flip it for quick cash. A few summers ago, I bought a portable, gas-powered generator for $40 at a yard sale. I sold it the very next day for $125. Vintage canning jars manufactured by Mason, Ball, and Atlas have transcended their utilitarian origins to become decorative items. Unusually large jars and the green or blue glass variety sell for a premium — especially if they retain their original zinc or glass lids. If you have any of these packed away in the basement, clean with a mixture of white vinegar and water and sell them for $8-$15 each. (See also: 9 Easy Mason Jar Gifts You Can Make). Anything from the '50s and '60s is red hot right now. Look for authentic pieces that are in relatively good shape. Dinnerware, flatware, coffee tables, chairs, and lamps are all home runs in the resale market. Last month, I snagged an iconic "starburst" wall clock at poorly-attended auction for $1. After giving it a 10-minute cleaning, I sold it on eBay for $70. Old metal rakes, spades, hoes, and other basic lawn care tools are well-made and easy to rehabilitate. Clean them well, use a grinder with a brush attachment to remove rust quickly, and then flip 'em for $10-$20 apiece. The best part? Anyone with a yard is a potential buyer! A good friend of mine in Austin, Texas has created a cottage industry buying, cleaning, repairing, and reselling bicycles to feed that city's thriving biking culture. Every weekend you can find him scouring local thrift stores, yard sales, and Craigslist ads for retro models from the '70s and '80s. Though some bikes do need significant repair (which requires a basic level of mechanical skill), most just need a little cosmetic TLC. They don't make lawn furniture they way they used to. Vintage aluminum, iron, and steel pieces are in demand for their durability and classic styling. Though complete sets are ideal, don't reject singles. Condo dwellers may only have room for one or two chairs, and other buyers prefer to mix and match. In July, a pair of untouched (read: slightly rusty) metal "clam shell" patio chairs sold on eBay for $85. What treasures have you found and flipped for minimal effort and maximum cash? Share your story!